Learning outcomes drive both course design and student assessment. All learning activities within a course should map to its outcomes. 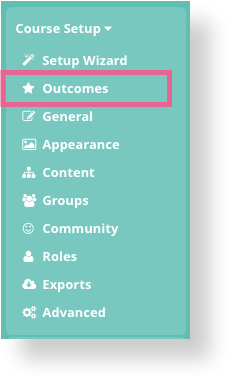 You can edit your course outcomes from the Outcomes page located under Course Setup in the sidebar. Set up your course objective and learning outcomes. Course Objective: A high-level statement describing what you intend your students to learn by the end of the course. Learning Outcome: Describes measurable skills, competencies, and knowledge that students should be able to demonstrate upon completion of the course. Set up shorthand tags for each of your learning outcomes. You can use these tags to link course content, activities, and student posts to relevant course outcomes. Outcome tags are also used in assessment to link assessment criteria to relevant course outcomes.